Aaron Ramsey will join Juventus at the end of this season and Arsenal boss Unai Emery has decided to give him game time in his last months with the club that gave him a chance to showcase his talent to the whole world. 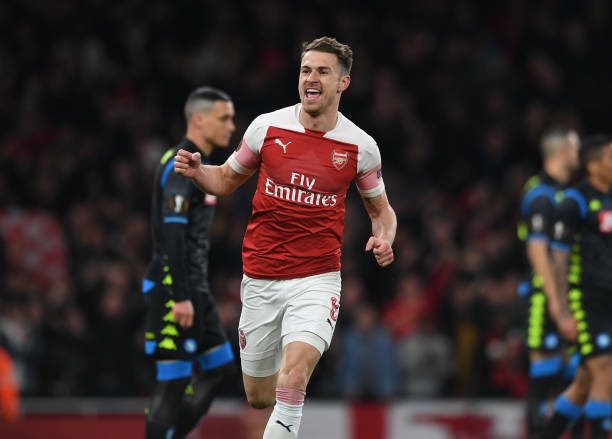 Aaron Ramsey has shown extreme professionalism in the last few months because you can clearly see that he is giving his best for Arsenal even though he knows that he is leaving at the end of this season. It’s unclear what happened behind closed doors in his new contract negotiations but he has however has no hard feelings towards the club as he hasn’t given the press any quotes for the press to make controversial articles to write about his departure from Arsenal. Aaron Ramsey was in the selected lineup that faced Napoli last night and he did not betray Unai Emery’s trust in him as he scored the first goal of the day which gave the gunners a boost to look for a second which they finally got. Arsenal’s head coach Unai Emery was impressed with the performance of Aaron Ramsey and has said that he believes that the Welshman pushes himself to perform better at the Emirates to make the supporters happy. “Here, with our supporters, he gives us more than all he can to do the best performance, not individually but thinking in the collective.” Unai Emery told Sky Sports. Aaron Ramsey will be hoping that Arsenal wins the UEFA Europa League this season so that he can go when he’s proud to have helped the gunners win this competition for the first time, and even if they don’t win it, the fans will always remember his winning goal in the FA Cup final in 2014 which ended their nine-year trophy drought.